Tuesday 10th and wednesday 11th of July the World Cup Semi finals are scheduled. We reached the stage where every team can reach the finals. The 4 best countries of the world are still in the tournament. The 2 semi finals are scheduled in Moscow and St Petersburg. And both matches are being played at 20:00 CET. On this page you find our best betting tips and our predictions for both games. Later this tournament we also add the predictions and betting tips for the finals. We take a closer look at the teams in the semi finals. And we look at the road they had to take to reach the semi finals. There will be 2 semi finals in Russia. Match 1 is between France and Belgium and they play in St Petersburg. A day later Croatia plays against England in Moscow. In the semi finals we only find teams from Europe. The last South American teams (Uruguay, Brazil) were eliminated from the tournament in the quarter finals. They lost against france and Belgium. These two teams now face each other in the first semi final of the tournament. Below you find a short story about every team in the semi finals. Before the start of this tournament Belgium was one of the favorites to reach the semi finals or finals. And they have shown some really good football. If we look at the Belgium squad we see an amazing player at every position of the field. Belgium has a super tactical coach with Martinez. And also assistant Thierry Henry is very important for the results so far. And maybe he will extra important for the semi finals because he knows a lot about the French football team and their manager. Belgium faces a top favorite again. In their quarter final they beat Brazil (also one of the top favorites). They played an amazing team and players like Lukaku, de Bruyne, Hazard and Courtois where briljant against Brazil. Every attack was a thread for the defence of Brazil. Belgium won every game till this stage. Who can stop the Red devils from winning this tournament? France is the top favorite to win the tournament if we look at all 4 teams. The French have an amazing squad with a few super stars (griezmann, Mbappe and Pogba). But till the last game they didn’t play their best football. They started the tournament with a though win against Australia and in the third group game they settled with a draw against Denmark (both teams qualified with a draw). France didn’t dominate their games in the group stage. But after the group stage they started to play better and better. First they beat Argentina with 4-3. What an amazing game that was. And in their quarter final they beat a South America team again. They beat Uruguay rater simple with 2-0. It looks like France is getting better and better at the right moment. They now face the strong Belgium side that has a huge amount of self convidence after beating Brazil. A lot of players of France and Belgium know eachother because they play in the same league or team. This is going to be very interesting because it is the thoughest game so far for France. Croatia played the most minutes of all four teams in the semi finals. In both their second round and quarter final game they played extra time. And both games got decided by penalty kicks. Croatia managed to stay calm and they won both penalty shoot outs. This is a real convidence boost for this team. They now know they can let the game go in to a penalty shoot out because they are on the winning hand. Croatia has a great midfield with Perisic, Rakitic and Modric. This midfield players can decide a game with an amazing pass or a free kick. they played a few good games but also a really bad game against Denmark. But they are still in the tournament and every team in the semi finals has a chance of reaching the finals. When their midfield gets back to world class again they can reach the finals. In their quarter final game they beat the hosts russia after the game ended 1-1. Both teams scored in extra time but Croatia was better in the penaly shoot out. They now face England in their semi final in Moscow. Is football coming home? Is the World Cup coming home? This is what all English are talking about right now. They are playing a very good tournament and they even won a penalty shoot out. Before this tournament England played 3 penalty shoot outs and they lost all of them. Against Colombia they managed to win a penalty shoot out and that gave hem a spot in the quarter finals. In the quarter finals they played against Sweden and they won this game pretty easy with 2-0. England has loads of convidence and they play Croatia now. They are only 1 win away froma suprise final game in Russia. Both England and Croatia are not top favorites to win this tournament. But 1 of them will reach the finals. And in a world cup final everything can happen. 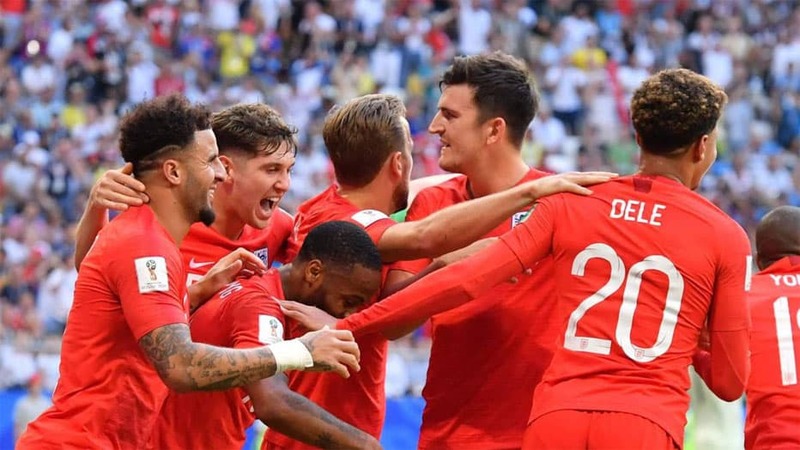 This England team has the full nation behind them and with their coach Southgate they have a very good chance to win this tournament. they only lost 1 game this tournament. That was a game they wanted to lose. They played against Belgium and the team that lost that game would be in the easier side of the world cup scheme. It is fun to bet on live games because it makes watching the games more exciting. When you want to place a few bets we recommend you to place online bets. At online bookmakers you find the best odds and the best betting options. You can simply join an online bookmaker and register a free account. Use a computer, tablet or your mobile phone to place online bets. There are a lot of different bookmakers available online. But not all of them are reliable and safe. We selected the best bookmakers for you in the table below. All online betting websites on our website are tested andreviwed. They are all 100% safe and reliable. When you want to place a few bets you can click at one of the betting partners below and register a free account. Make a real money deposit and collect the available welcome bonus. Now it is time to give you our predictions and the best betting tips for the semi final games. For me this is the final. France and Belgium are the two best teams on this World Cup till now. Now they play each other in an epic semi final in St Petersburg. Tuesday 10th july will be all about this game because it feels like it is going to be an epic one. france is getting better and better. And Belgium is scoring goals like crazy. Every game they create a huge amount of chances and with their perfect counter attack they can beat every team on this world cup. They already beat Brazil and England. Will France be next? France is favorite if we look at the bookmakers. At Bethard you get 2.55 times your bet amount when France beats Belgium in the regular time. Personally I think Belgium has a stronger team. Their attacking force can beat the relative weak defence of the French. This will be key in this game. Will Hazard, Lukaku and de Bruuyne again be in a great form? If yes, Belgium will beat France. It is now possible to bet on France – Belgium. The bookmakers have opened up all betting on this game. And you can bet on everything you can imagine. Own goals, penalty kicks, headers, cards, injuries and results. We selected a few interesting bets for you. We selected the bets at our official betting partner Bethard. Underneath you find the best betting tips and the best odds for these bets. England are top favorites to win this game when we look at our preferred betting partners. But I think this is going to be a very close game. Before the tournament I already predicted Croatia to reach the semi finals and even the finals. We placed a €10 bet on Croatia to win this tournament. This still can happen but they have to play their best game of the tournament to beat England. Modric, Rakitic and Perisic will be the key players in this game. When they reach the same level as they had in the game against Argentina. Than Croatia can beat England. England did not really played against a top favorite team before this game. This game is a huge opportunity for both teams to reach a final of a World Cup. The pressure is on the favorites England. But both teams will be very nervous. England has got a really young team and Craotia have a lot more experienced players. I think both teams are going to play attacking football. And that will give the other team the chance to score on a counter attack. Croatia has a midfield that can give 50 mter passes to their attackers. All bookmakers think England is going to win this game within 90 minutes. You get 2.30 times your bet amount when you bet on England to win. But I predict a close game and a draw after 90 minutes. In extra time both teams don’t score and again a penalty shoot out has to make the decision. Croatia and England have won their shoot outs this tournament. Both keepers are in a great form. But in the end I think Croatia will reach the finals.